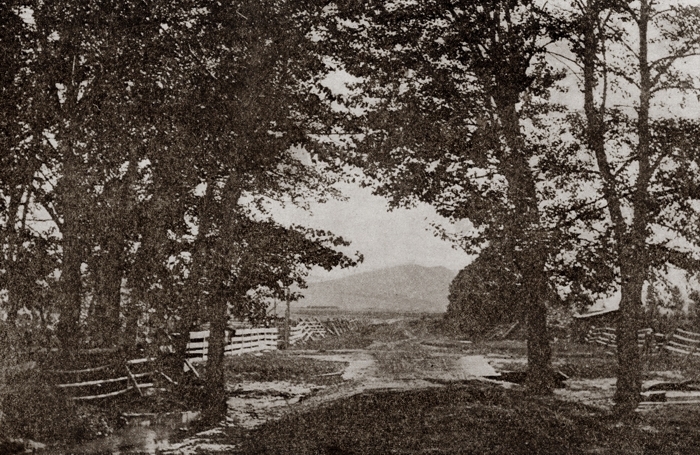 The Don and Nancy Burnham ranch is today located on the left-hand side of what remains of this road. COLLECTION OF ROY E. MILLEGAN, SR., FROM 'VALLEYS OF THE PRICKLY PEAR', 1988, LITTLE RED SCHOOLHOUSE, INC. 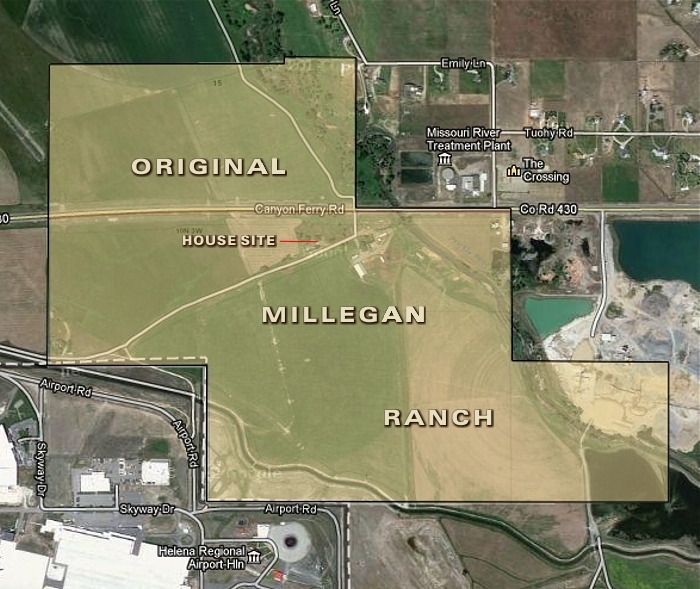 Located about four miles northeast of Helena on the banks of Prickly Pear Creek, the Millegan Ranch was started in 1865 by Wallace L. and Martha A. Rockefellow Millegan. 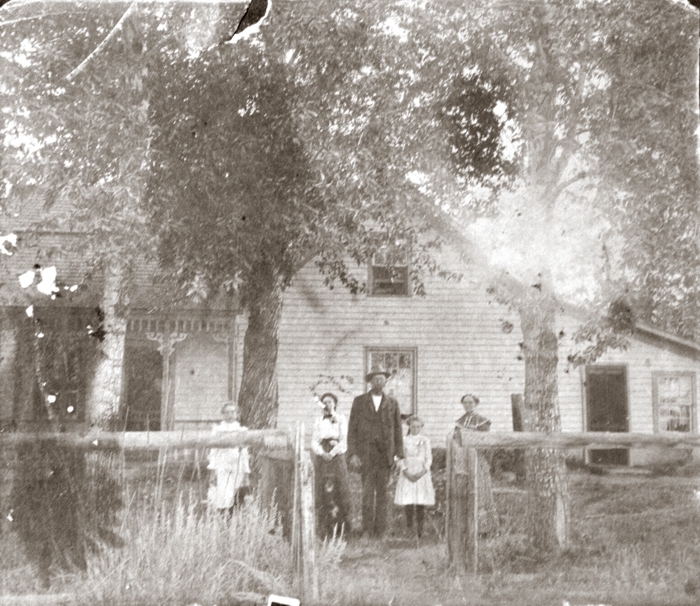 The house pictured here, their second one on the land, was comprised of railroad section houses, put together in 1910. Wallace was the son of James Alexander Millegan (1796-1881), who is evidently the earliest-born person buried in Helena's historic Benton Avenue Cemetery. He died in Helena at the age of 85, shortly after coming there from the Pearlette Colony in Meade County, Kansas. 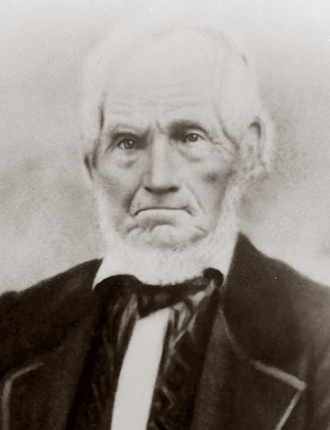 From a Map by Roy E. Millegan, Sr.
Wallace Millegan (1837-1923), the youngest of nine, was educated in the frontier territory of Wisconsin, receiving his education in a primitive log schoolhouse. He remained with his father, James Alexander Millegan, until 1859, coming across the plains to Pike's Peak, Colorado. 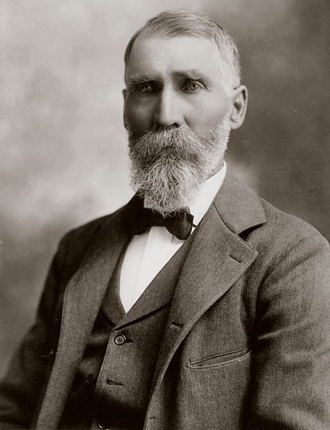 Wallce worked at the Gregory Diggings with William A. Clark, who became a long-time friend, and one of Montana's notorious "Copper Kings." On April 14,1863, Wallace set out for Bannack, Montana, and later to Alder Gulch, which became Virginia City. His claim on Grasshopper Creek, site of Bannack, was Number 29, above Stapleton's discovery. Alder Gulch did not keep him long, and he returned to Bannack. In the Fall of 1863, Wallace went east to Iowa, and on April 9, 1864, he married Martha A. Rockefellow. 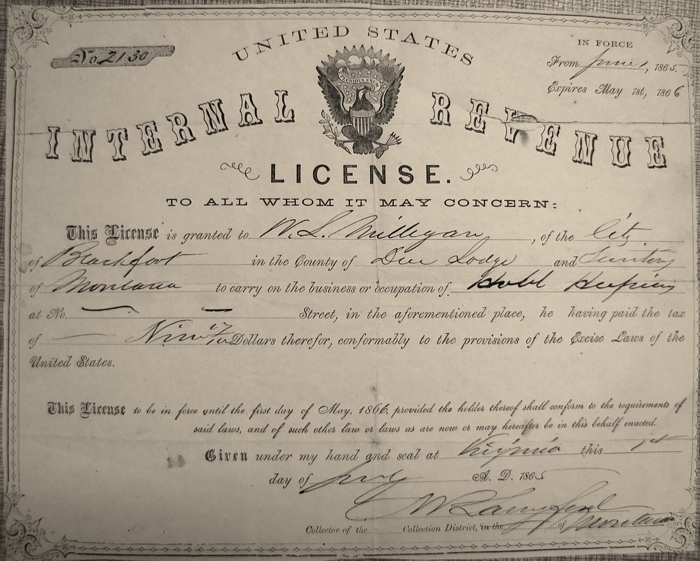 Wallace and Martha moved to Montana, arriving in Bannack on July 29,1864. 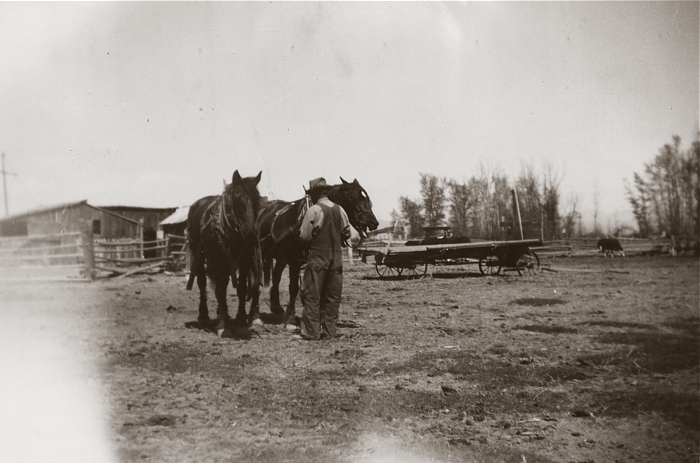 Wallace began putting up hay on Horse Prairie and sold the hay that winter in town. He also put the roof on the first building used as a Territorial legislative hall. He always said he never got paid for that job. 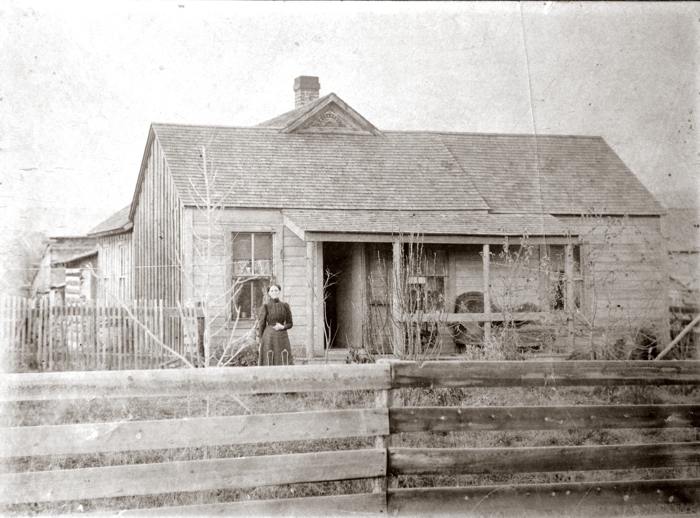 The boarding house proved to be unsuccessful, so Wallace and his young family left Blackfoot City for Helena by ox team, arriving in October of 1865. They went into the Prickly Pear Valley, looking at a ranch for their home. 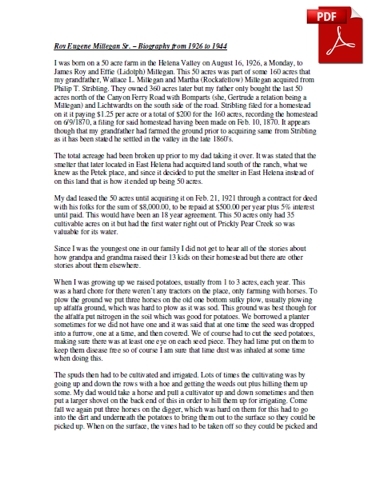 It was a piece of ground P. T. Stribling had a quit claim on. They settled into a 16 x 20 log cabin on the banks of the Prickly Pear. This 160 acres was soon to become theirs with Homestead Certificate Number 13, said certificate being signed by President Grant. right dated December 27, 1865. 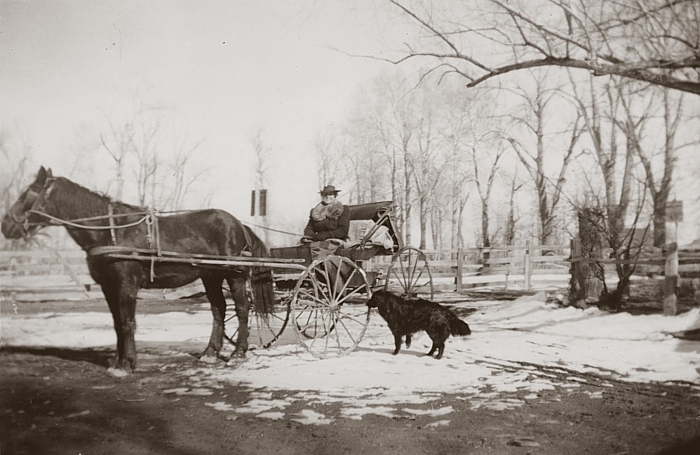 In the Spring of 1866, the cleared ground was plowed with oxen and a hand-made plow, containing a home-made shear. Garden crops were grown and sold to the miners along Last Chance Gulch. After more clearing, peas, wheat, and barley were planted. It is said that in 1871 Wallace sowed the first alfalfa in Montana. It is noted that in 1868 wheat averaged 58 bushels to the acre. Some grains were sold to the Kessler Brewery. Hogs were raised by the Millegans, and they acquired over 300 by 1890. Most of them were Poland-Chinas, the oldest American breed of swine. The year 1908 was the last of the horse round-ups on the local ranges, extending from Winston to Clancy and across the Prickly Pear Valley. Millegan participated in that drive which garnered only 55 horses. 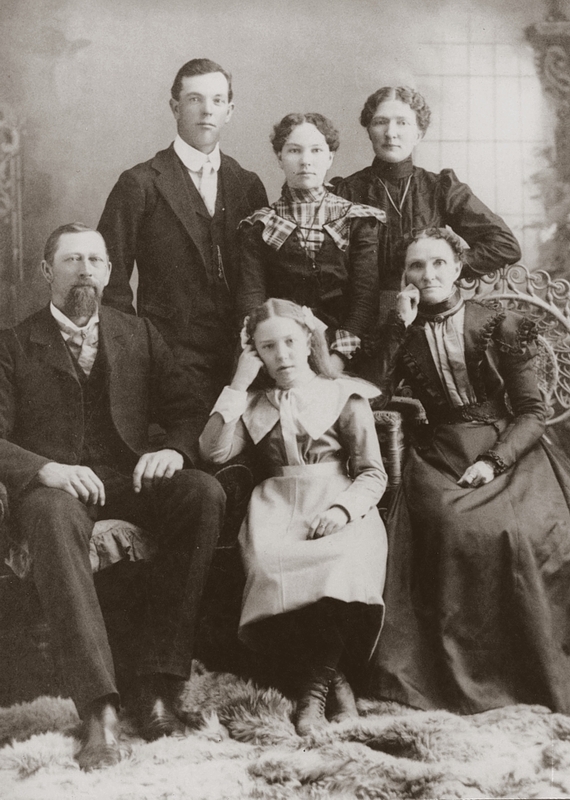 Wallace and Martha were the parents of 13 children, 10 of whom were born on the Helena farm (Carrie Mitilene was born in Bannack, Montana Terrritory in 1865, and George W. was born in Sparta, Wisconsin during a visit there by Wallace and Martha in 1882). 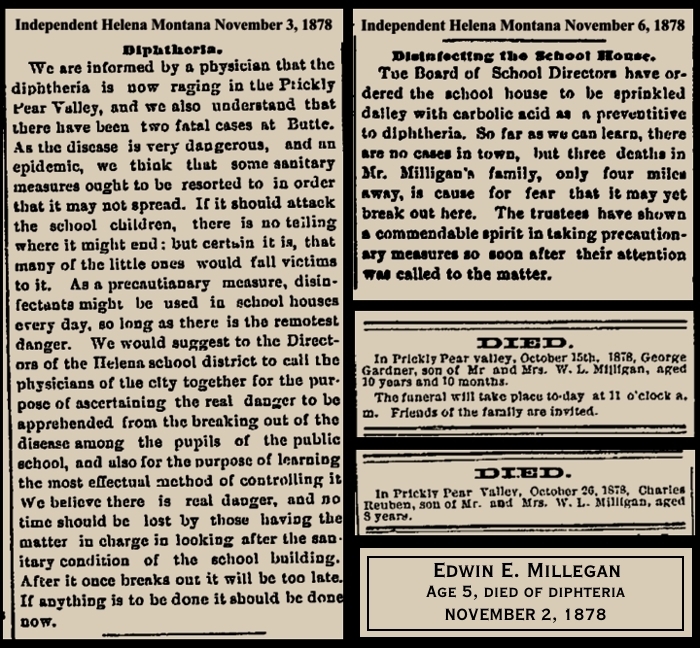 Nine of these children attained adulthood, but Elenor died in Helena in 1868, at six months of age, and three children succumbed to diphtheria in 1878: Eleanor at one year,George at nine, Charles at eight, and Edwin E. at five. 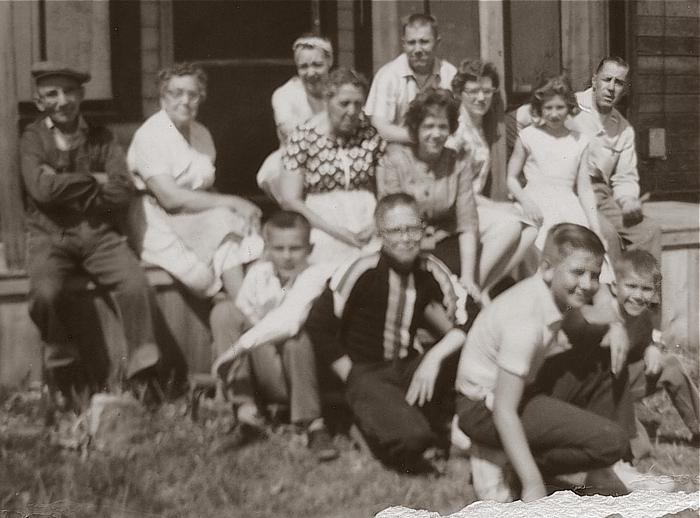 Surviving children were: Carrie Mitilene (Evans), William Lewis, Hattie Ann (McCollum), Martha Eleanor (Little), Robert Leroy, James Roy, George W., Cora Belle (Smith), and Nina May (Morrison). 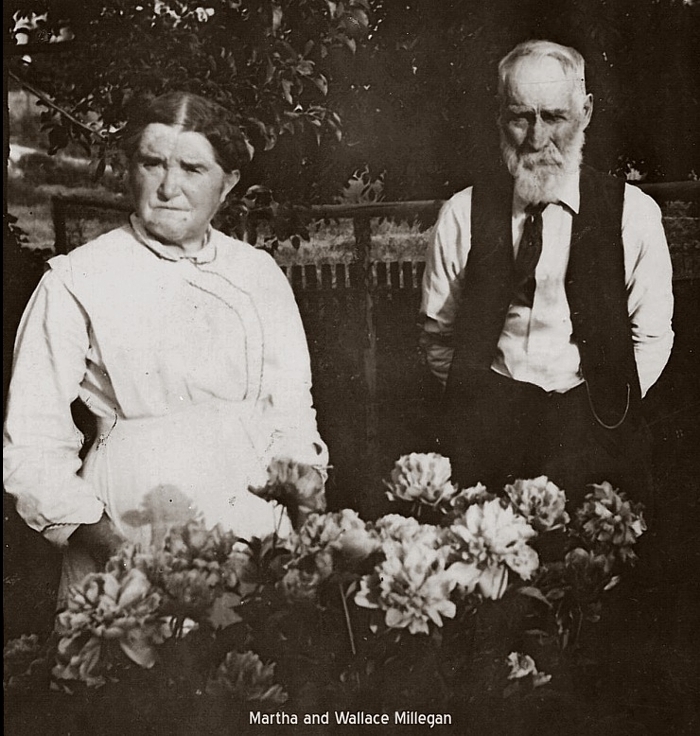 Wallace and Martha belonged to the Society of Pioneers, often taking in the meetings wherever they were held. There, they would be able to visit with W. A. Clark and others about their early experiences in this new state. 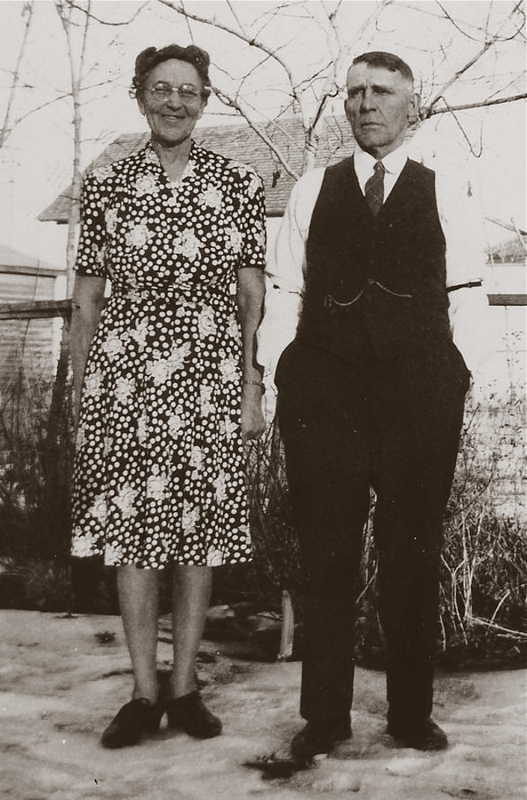 Wallace and Martha spent their last years living in Helena, at 1031 8th Avenue. He died in 1923 and she in 1926, each at the age of 86. Wallace was buried in the Benton Avenue Cemetery, but was moved to Forestvale Cemetery in 1926 when Martha died and was buried in Forestvale. 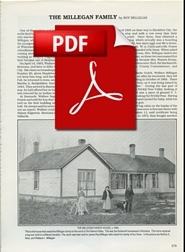 On January 6, 1909, James Roy Millegan (1880-1953) married Effie Lidolph (1888-1980), daughter of Herman and Frances Lidolph, pioneer Helena gardeners. 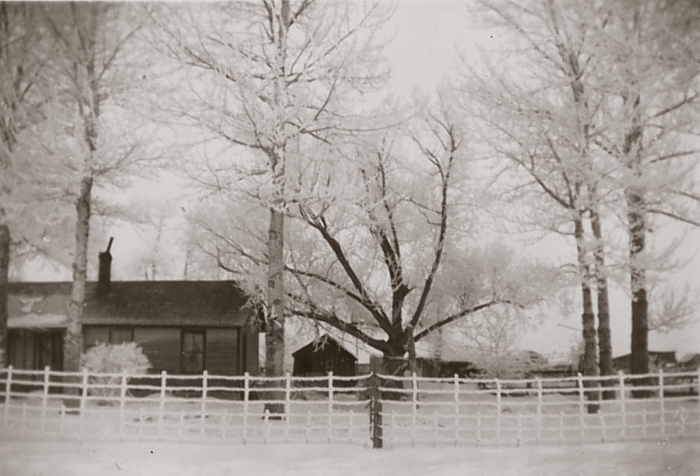 In March of 1909, James Roy and Effie leased the 50-acre ranch, purchasing it in 1921. 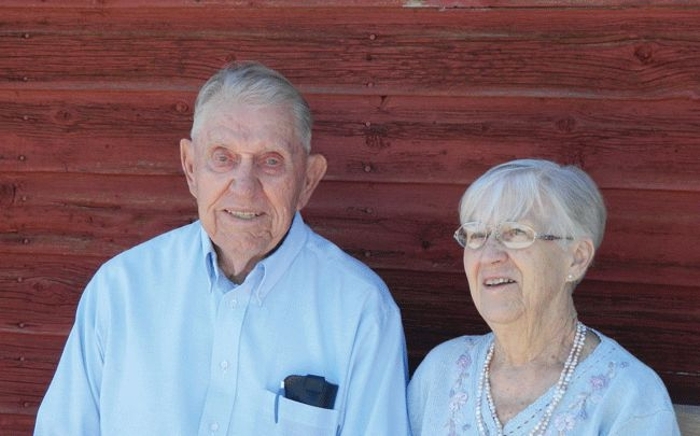 They had four children: Gladys Lucille Millegan Frank, Wallace H. Millegan, Virgie Mae Millegan Baird and Roy Eugene Millegan, Sr.
James Roy Millegan bought the 50-acre ranch in February of 1921, putting $1,000 down, with the balance of $7,000 to be paid at $500 per year at 5% interest. During the years of the Great Depression, they fell behind on payments, but because it was a family transaction -- and because nobody else in the family wanted the ranch -- they were able to stay on the land. During some of those Depression years, James Roy and Effie only brought in about $800. 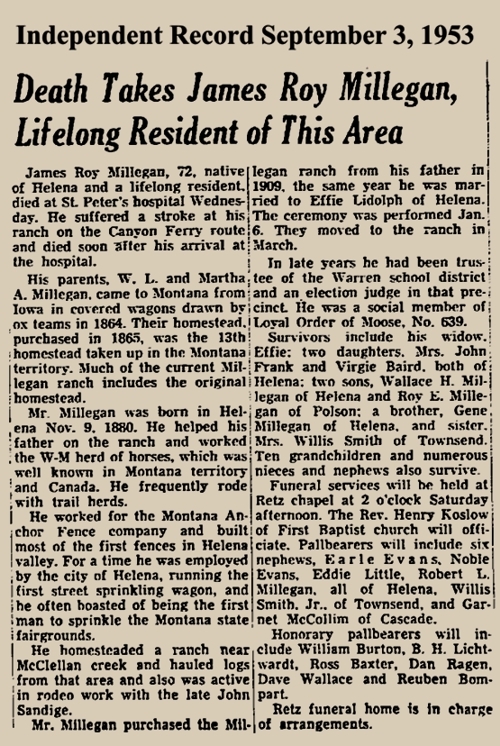 James Roy Millegan (1880-1953) better known as Roy, was born in the Prickly Pear Valley on the Millegan farm, as were his 12 brothers and sisters. 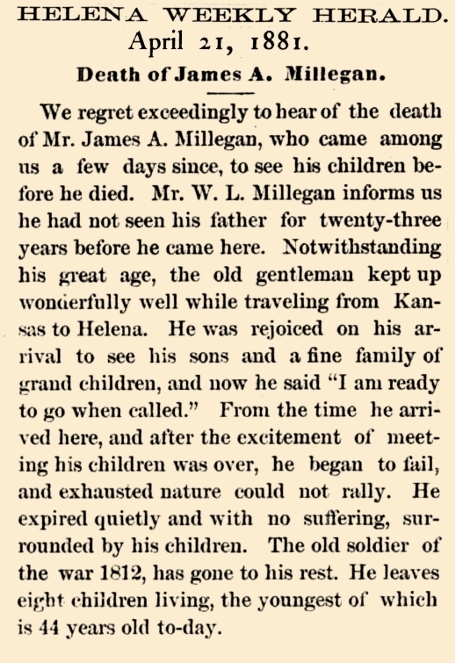 He was the tenth child of W. L. and Martha Millegan. He received his education at the Warren School, which was originally built in 1866 or 1867. He was later a trustee and clerk for the school district. his duties were taking care of the large horse herds, running on the range under the "WM" brand and marketed from Helena to Canada. On one of these drives, he was picked up by the Indian police and taken to see the Sergeant-Major, but was soon released to continue the drive. He was captain of these roundups for two of the three years. Roy fenced for the Anchor Fence Company, and many of the early day fences in the Valley were built by him. For some time he was employed by the City of Helena, running the first street sprinkling wagon, and once boasted about having been the first to sprinkle the grounds at the State Fair. Roy did some rodeoing at one time along with an early day rodeo personality, John Sandidge. 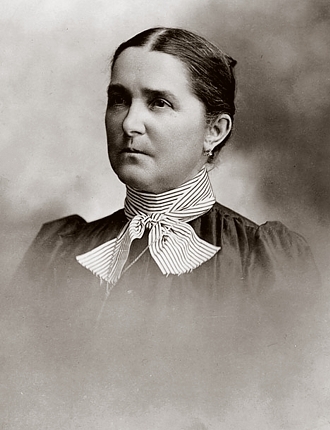 Effie Lidolph attended schools in East Helena and Canyon Creek. 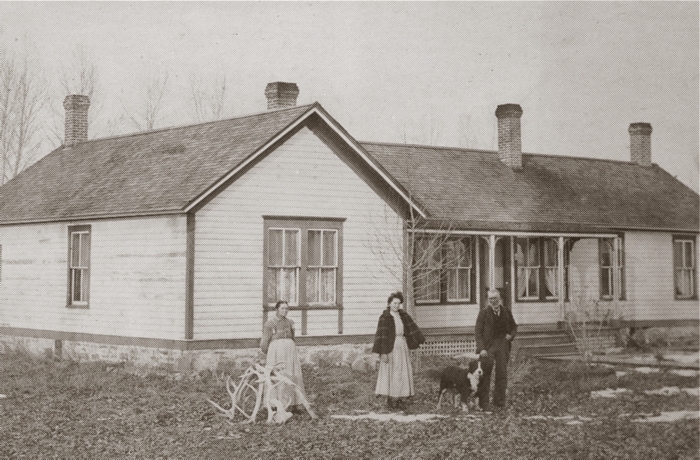 As a young lady, she assisted with Sunday school at the East Helena Methodist Church. Her work was always on the farm, milking the cows, taking care of the chickens, and working in the large garden, as well as in the fields. She was a charter member of the Prickly Pear Home Demonstration Club, to which she belonged for over 50 years. When Roy died on September 2, 1953, Effie carried on until ill health forced her from her home of some 65 years. She died on January 13, 1980. 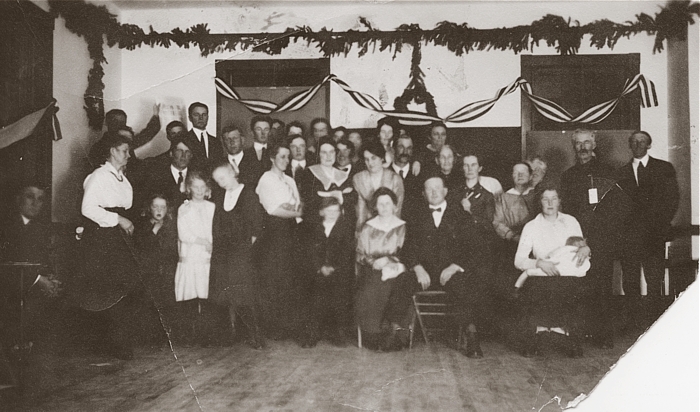 Pictured above is a 1910 gathering at Warren School; the occasion is unknown. Effie Lidolph Millegan is seated on the right, holding her inafant daughter, Gladys Lucille. 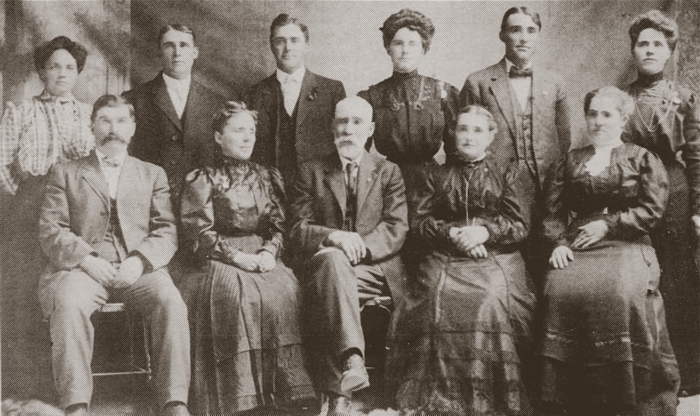 James Roy Millegan is seated on the far left. 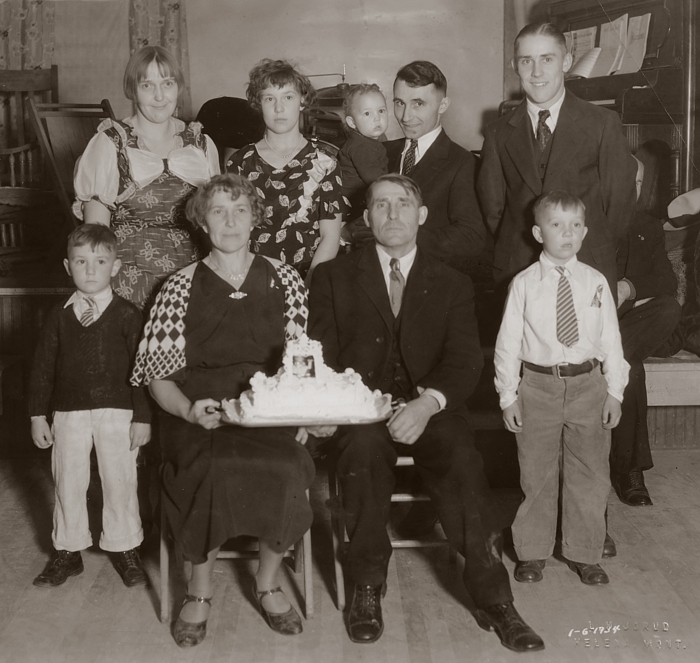 The children of Roy and Effie are Gladys Lucille Millegan Frank (1910-2007); Wallace H. (1914-1990); Virgie Mae Millegan Baird (1921-1999), all of Helena, and Roy Eugene (1926 - ) of Whitehall, Montana. Photos Courtesy of Roy E. Millegan, Sr. The spreading willow tree was planted about 1910 by Martha A. Rockefellow Millegan. The story, passed down through the family, is that she buried a dead chicken, and stuck a green willow shoot into the hole. This beautiful tree was the eventual result. The house did not have running water or indoor plumbing, except for a kitchen sink which drained into a septic tank. The hand-dug well under the wooden back porch was about 15 feet deep and lined with rock. The water was brought up with a long-handled manual pump. 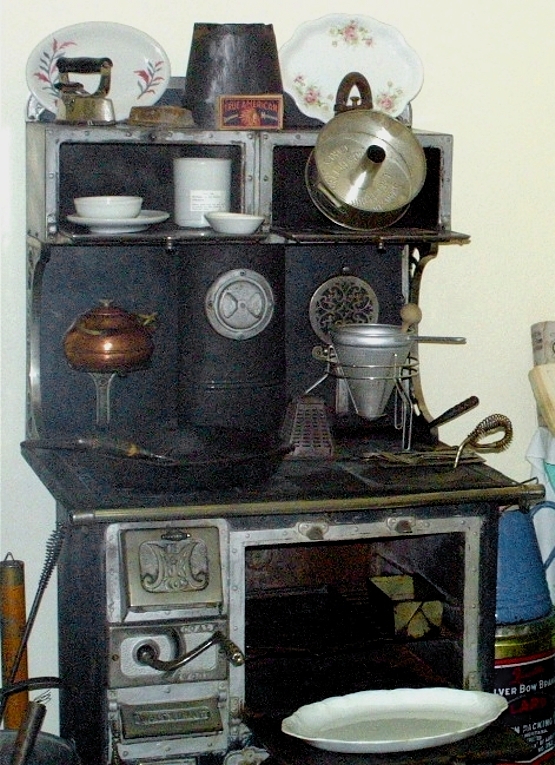 Hot water was made by filling a reservoir on the side of the wood and coal-burning Monarch kitchen range. Electricity was not available until 1948. Putting up hay with a derrick, using one horse on the wagon and one on the derrick. The hay was mowed, raked with a dump rake, shocked, then loaded onto the wagon and brought to the stack yard. Atop the haystack is James Roy, with his oldest son Wallace H. on the wagon, and his youngest son, Roy Eugene, playing in the tub. James Roy Millegan farmed exclusively with horses his entire life; he never owned a tractor. Effie Millegan often drove this buggy into Helena and back, taking chickens, butter and produce to trade for groceries and other goods. The horse's name was "Blackie". A large garden provided the family with most of the needed vegetables. There was an abundance of milk and beef from home-raised cattle, and hogs were also raised. 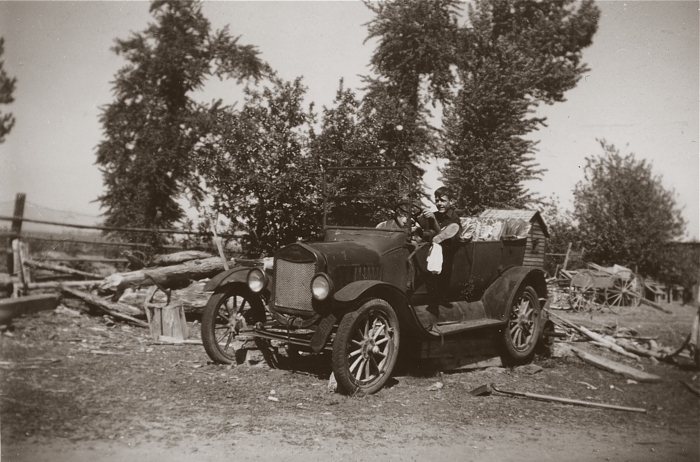 This old Model-T provided some transportation, and was also employed for sawing wood. The back wheels were jacked up and blocked, a belt was put on one of the back tires then connected to a buzz saw to cut splittable rounds from logs. Logs were brought from the many cottonwood trees that grew along the banks of Prickly Pear Creek, but also from as far away as the wooded hills north of Lake Helena. Sitting in the car is family friend Daniel W. Schofield; photo taken about 1943. The log building, on the left, was originally the blacksmith shop. It was later used to house the newborn calves. Along the east side of the log building was the outdoor blacksmith bench, where one would sharpen mowing machine blades, shovels, and do any sort of heavy work. Behind Effie Millegan and the dog is the barn. On the right is a well house, from where water was drawn for the livestock, usually for the horses as the cows drank either from Prickly Pear Creek, which ran through part of the pasture, or from the irrigation ditches in the summer. 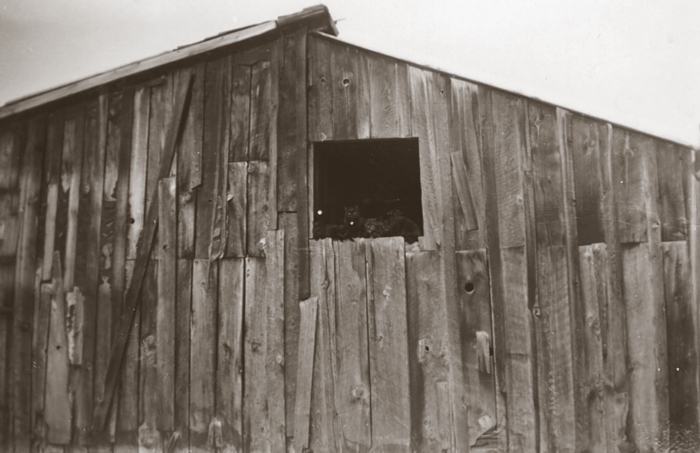 The south side of the barn, with black kitties in the window. The barn had five horse stalls which could hold nine horses, a milking barn which could hold four cows at a time, a granary and room for hay strorage. The hay yard was just north of the barn. Operations on the ranch slowed down somewhat after World War II, as James Roy and Effie entered a sort of semi-retirement. 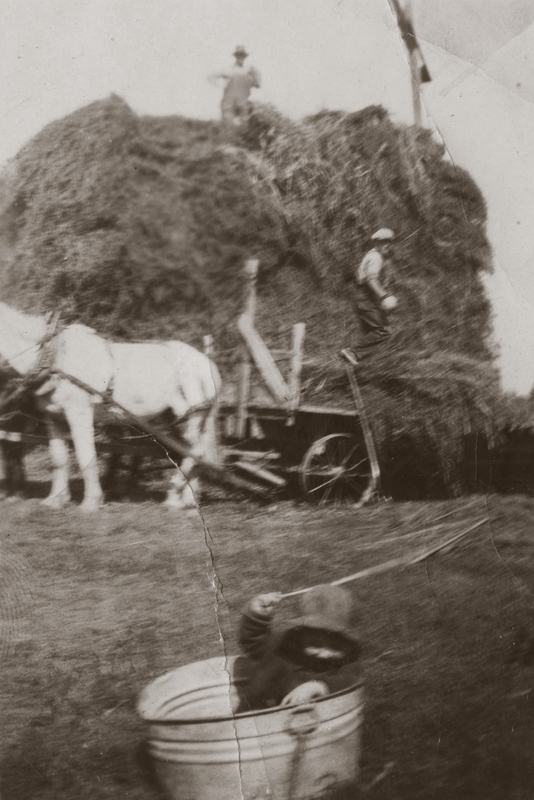 Some jobs were hired out, such as putting up the hay. Dairy cows were no longer kept. James Roy died suddenly in 1953. Following his death, Effie rented out the pasture land. 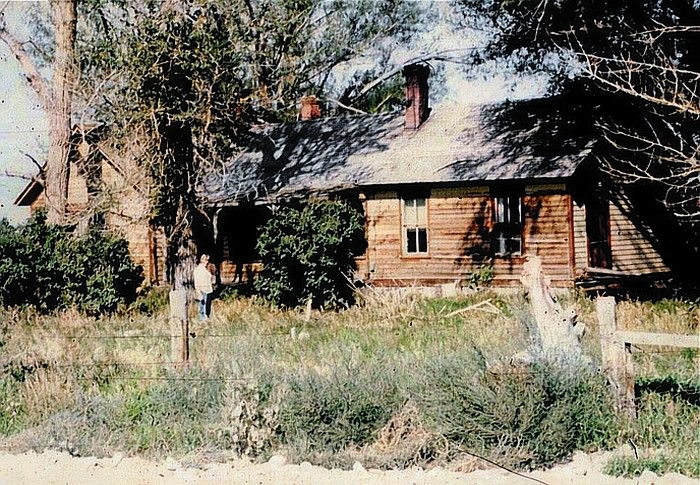 By the late 1960s, Effie Millegan's health began to decline, so the ranch house was shuttered and she moved into town to live with her children. She eventually entered a rest home, and died on January 13, 1980 at age 91. The land was subsequently sold. 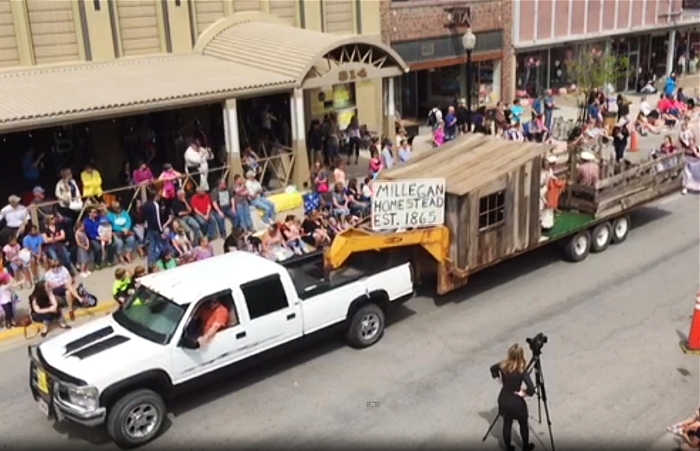 The May 1, 2015 Vigilante Parade featured a large float depitcting the Millegan Homestead.